Target is in the middle of ramping up for the all-important holiday shopping season by hiring a slew of folks to slip on a red shirt for a few weeks, but the retailer says it expects to hire 2,000-12,000 fewer seasonal employees this year than it did in 2011. Target also says this shouldn’t be seen as a bad thing. According to the Minneapolis Star-Tribune, the dip in seasonal hiring by Target is not necessarily a sign of shrinking in-store sales. Instead, a company rep claims that part of the reason for the smaller number is that around 1/3 of last year’s seasonal employees were ultimately hired on to fill year-round slots. Also, the number is tied to the availability of current employees and their desire/willingness to take on additional hours during the holiday season. 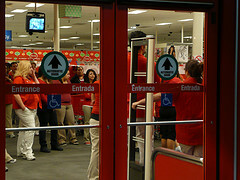 In all, Target expects to hire anywhere from 80,000 to 90,000 people by the end of this season. If you or someone you know feels like giving it a shot, the company will be bringing new people on board into December.